Our beautiful painted and mango wardrobes are made from solid hardwood; real showstoppers in your bedroom! The perfect finishing touch for your bedroom, we have designed a stunning range of painted and mango wood wardrobes. The ideal piece of bedroom furniture, they combine a smooth finish with carefully selected hardware, which work together to allow the beautiful tones of the solid hardwood to shine through. Each wardrobe offers lots of storage. Available in two door and three door styles, there is ample hanging space as well as deep drawers to hide bedroom clutter out of sight. Our drawers are made using real dovetail joints for strength and durability so you know your painted or mango wardrobe will stand the test of time, no matter what you store in it. 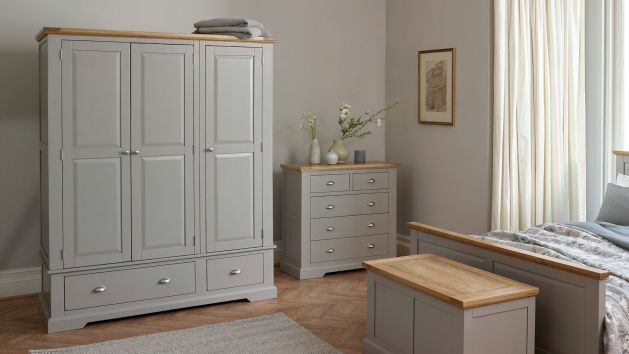 We only use the highest quality materials in our wardrobes; even the backs, bases, and drawer runners are only made using 100% solid hardwood. Browse all our painted and mango wardrobes below. With stunning finishes, there's a perfect wardrobe for your home waiting for you.